I've sent out 51 requests so far. Not very many, but I should easily hit my goal of 75. 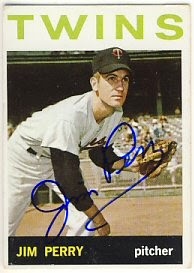 I'd like to find a bunch of 1963 and 1964 Topps to send out. 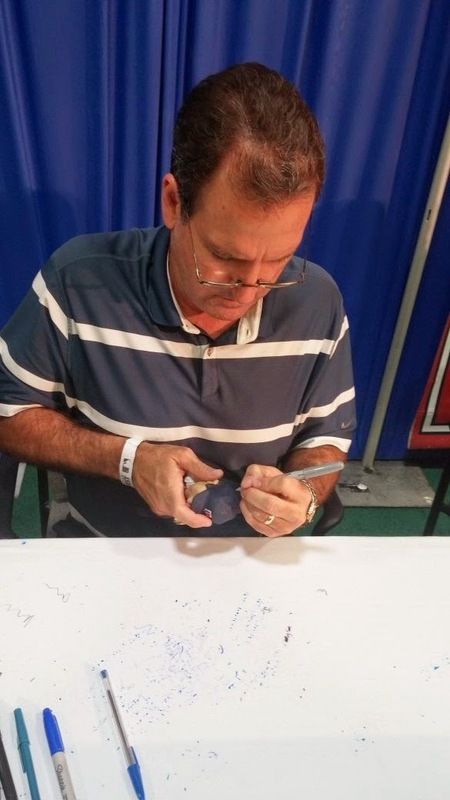 I've added two autographs to my 1991 World Series set including Randy Bush and Scott Leius. I also added Randy Bush to my 1987 set. I've completed this goal. 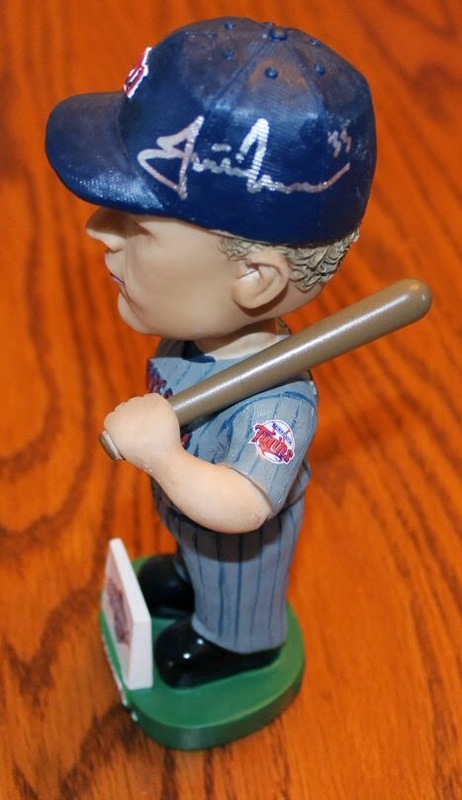 I also added ten other bobbleheads, including Joe Mauer, Kent Hrbek, Josh Willingham, Ron Gardenhire, Dan Gladden, Bert Blyleven, two from Justin Morneau, Harmon Killebrew and Doug Mientkiewicz. I've completed this goal as well. I really enjoy working on these bobbleheads, and have plenty more to get signed. I may have set my goals too low, but I felt they were realistic at the time. I hope to spend more time with ttm requests now that my sons' baseball seasons are wrapping up. 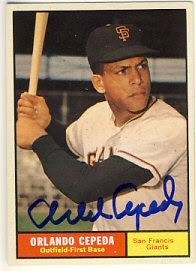 I got cards signed for my son in the Gaylord Perry and Juan Marichal lines, so my first autograph was Orlando Cepeda, who signed a 1961 Topps for me. Then we went to the Randy Bush line, where my son helped me out. 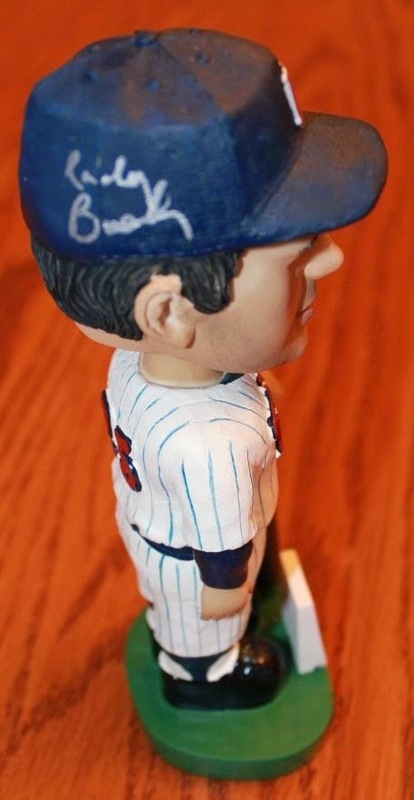 I got both the 1987 and 1991 Twins World Series bobbleheads signed. For the 1987 set, I am now down to Don Baylor and Les Straker as the only two I need to get signed (Puckett and Niekro are deceased). 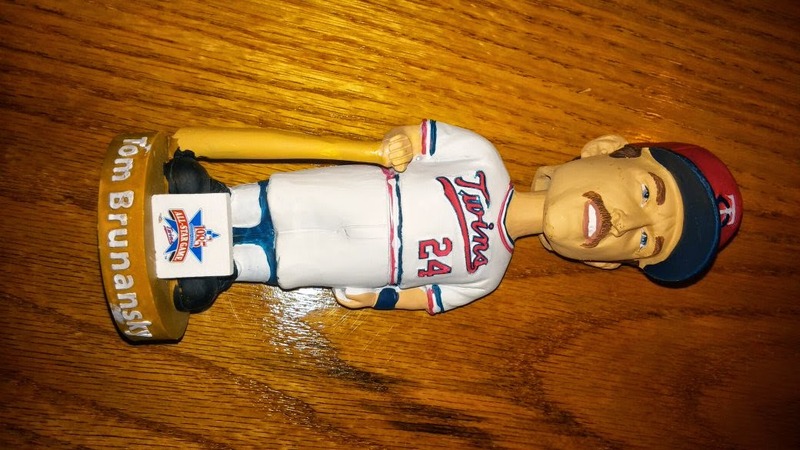 Next, Doug Mientkiewicz signed his SGA bobblehead. I've been hoping he'd be at TwinsFest the last few years, so I was happy to be able to get this one signed. Finally, I had time to get through Jim Perry's line. Actually, we had time to go through many times, but my son had already been through twice and we didn't have anything else for him to sign. 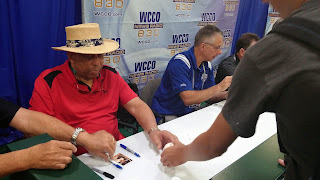 I had him sign a 1971 Twins program that I've had for a while and was also planning on getting signed at TwinsFest, but hadn't gotten around to it. That's it for autographs. 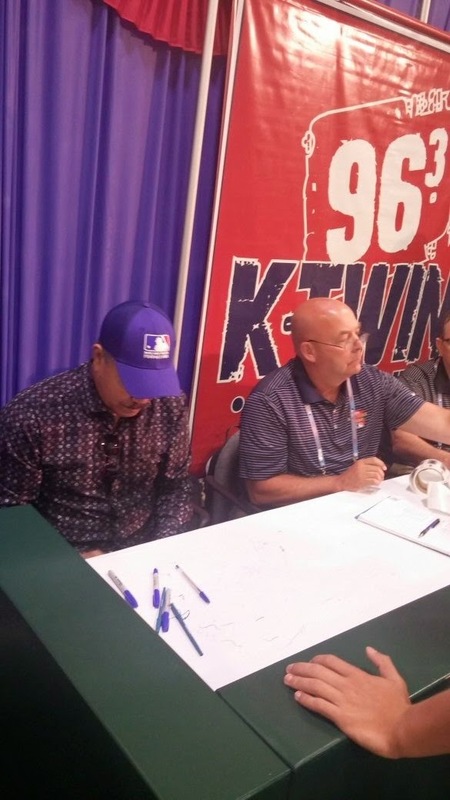 We didn't get as many as we do during a day at TwinsFest, but that's because there was only one person signing at each station. 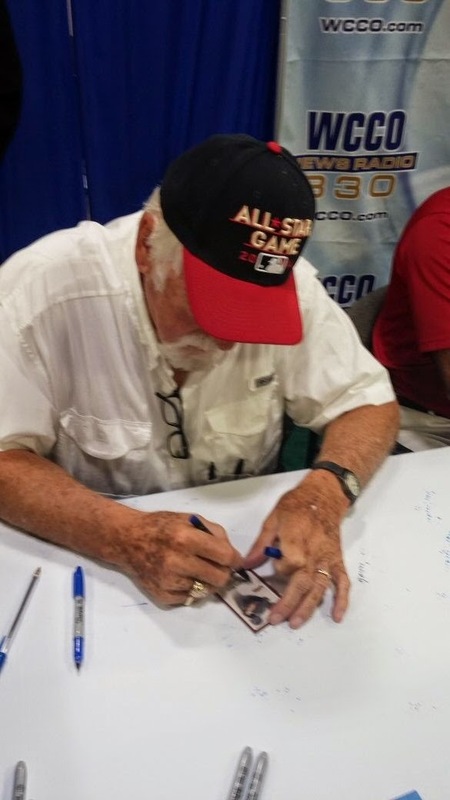 However, as there were many Hall of Famers, and the autographs were free after admission, it was a great way to add some autographs to our collections. 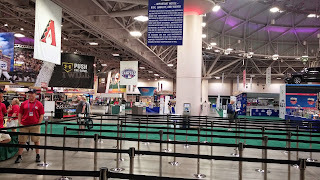 The event was very organized and there was plenty of room at the Minneapolis Convention Center, so it never really felt crowded. 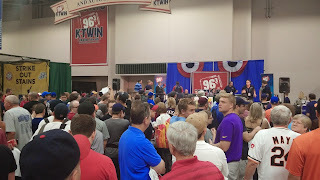 It was a fun event and a nice mid-season way to get some autographs now that the Twins no longer have the Autograph Party. Too bad this can't be in Minnesota every year. 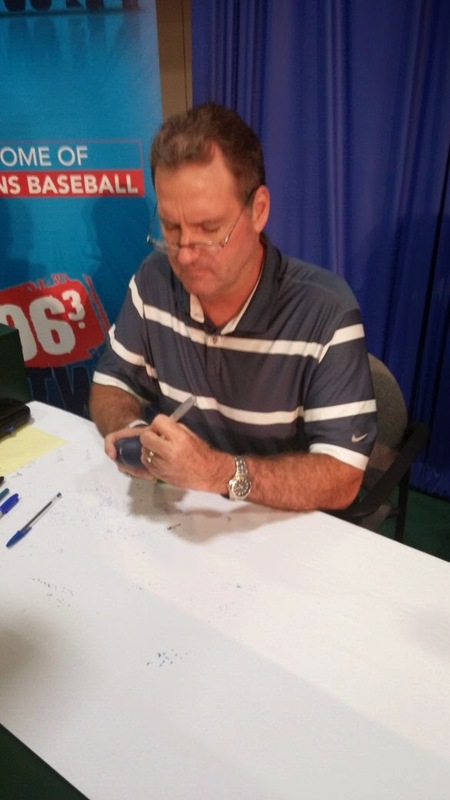 I found a little more time to get some of our FanFest autographs scanned. This weekend has been very busy as both my sons have baseball tournaments. 6 games between them so far. 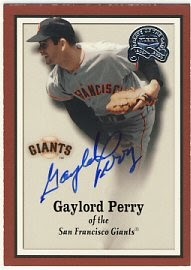 Our first line of FanFest was Gaylord Perry. My son got a ball signed and I got a 2000 Fleer Greats of the Game signed for him as well. 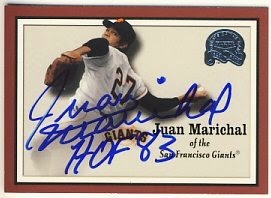 As I posted before, we were luck to get through the Juan Marichal line as well. Again, my son got a ball signed and I got him a 2000 Fleer Greats of the Game signed. 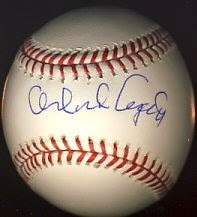 After Marichal, we went through the Orlando Cepeda line. John got another ball signed. 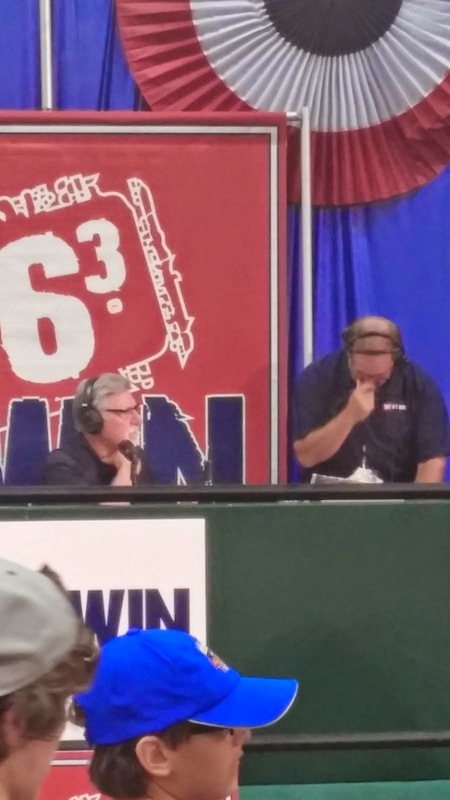 The next line was Randy Bush, and John got a bobblehead signed for me. I'll post my autographs later. Then, John went to the Jim Perry line. He got through that line twice in the time it took me to get through the Doug Mientkiewicz line once (Minetkiewicz was 25 minutes late). 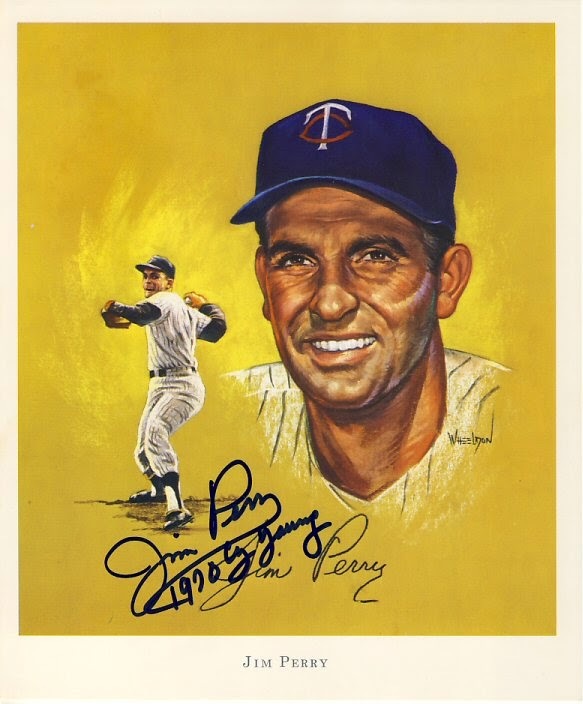 Then we both went through the Perry line again, so John got three autographs from him, including a 1964 Topps, a John Wheeldon SuperValu giveaway print, and a SGA 1965 World Series bobblehead. That's it for my son's autographs. Next I'll post the few that I got. 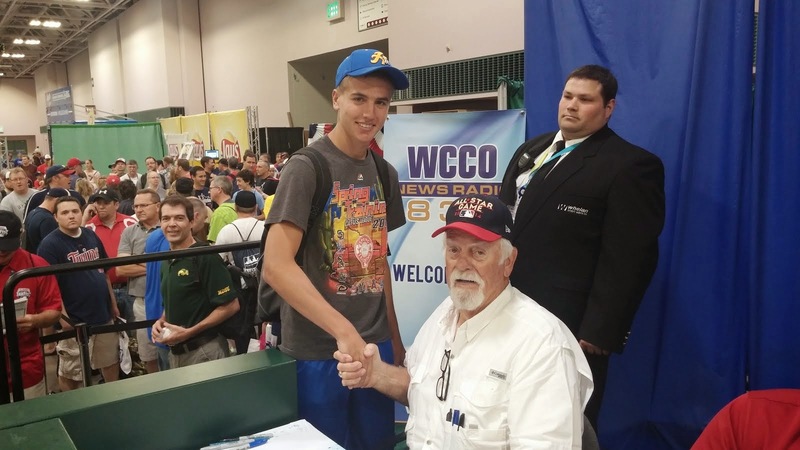 Last week I sent a card to Cole DeVries who lives here in Minnesota. 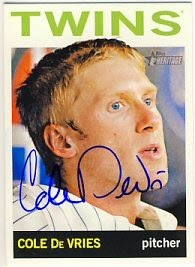 Today I received the 2013 Topps Heritage that he signed for me. I've been taking some pictures and scanning some of the autographs we got at FanFest but I'm not quite done. I'll probably complete it in the next couple of days and post them then. 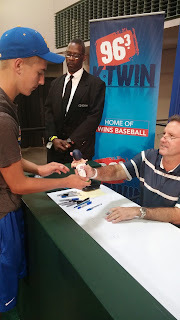 I made it through the Doug Mientkiewicz line after my son had been through the Jim Perry line twice! Then we went through the Perry line again. We bought a few souvenirs and a few bags of mini donuts and headed home. It wasn't nearly as crowded as I feared it would be. 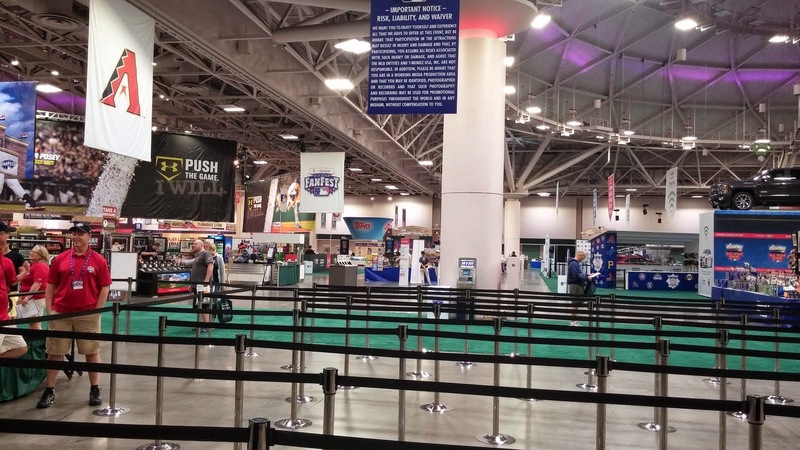 I'd compare it to a Sunday crowd at TwinsFest. Later this week I'll post pictures of our autographs. 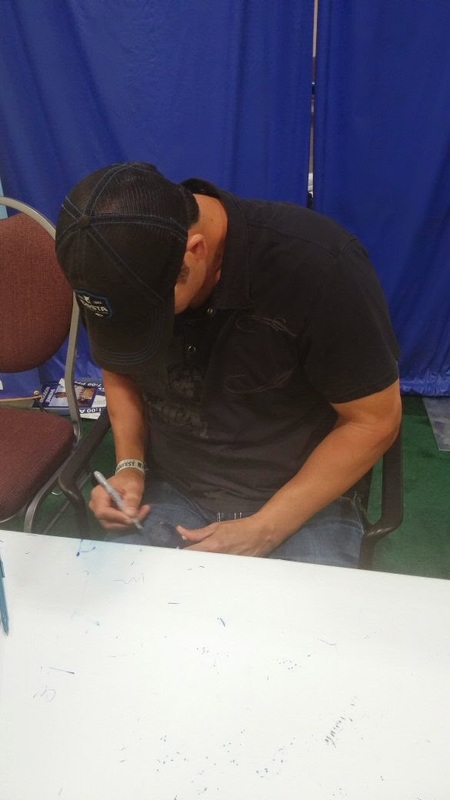 So far, Doug Mientkiewicz is 25 minutes late for his autograph signing. I got both my bobbleheads signed (Thanks to my son). Now I'm waiting in my last line of the day: Doug Mientkiwicz. We got through Cepeda's line quickly, then walked around a bit. Now we're waiting in line for Randy Bush. 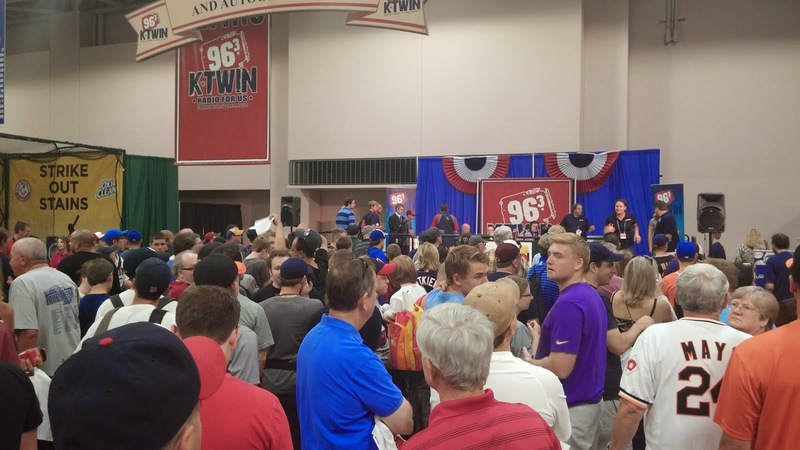 My son is going to help me out in this line and get one of my bobbleheads signed for me. 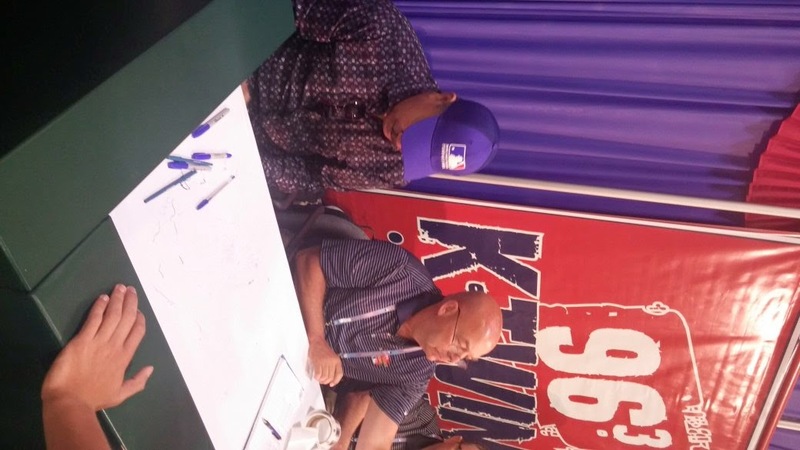 I got cards signed for him at the Perry and Marichal lines. We were in good shape with about 10 minutes to go in Juan Marichal's line when Sid Hartman shows up and sticks a microphone in Marichal's face, bringing the line to a grinding halt. 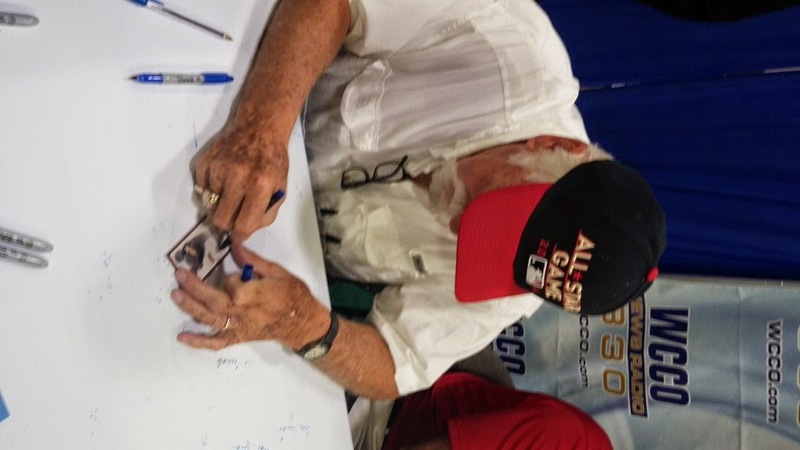 We ended up being the very last two people to get his autograph. We grabbed something to eat, looked around at the stuff for sale, and now we're in line for Orlando Cepeda. He starts signing in just over an hour. There are about 50 people in front off us. While we're waiting for Juan Marichal, we're listening to Jack Morris on KTWN. We're getting close, and there's just under 30 minutes left. I think we'll make it. The line's pretty long. We're trying to calculate if we'll make it or not. We got through Gaylord Perry's line quickly and he offered to pose for a picture with my son. 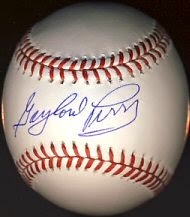 All autographs also come with MLB authentication. There are about 30 people in front of us so maybe we'll have a chance to see Juan Marichal after this. We're about 20 minutes early and standing in line to get in. This sure beats the 20 below wind chills we usually endure at TwinsFest. 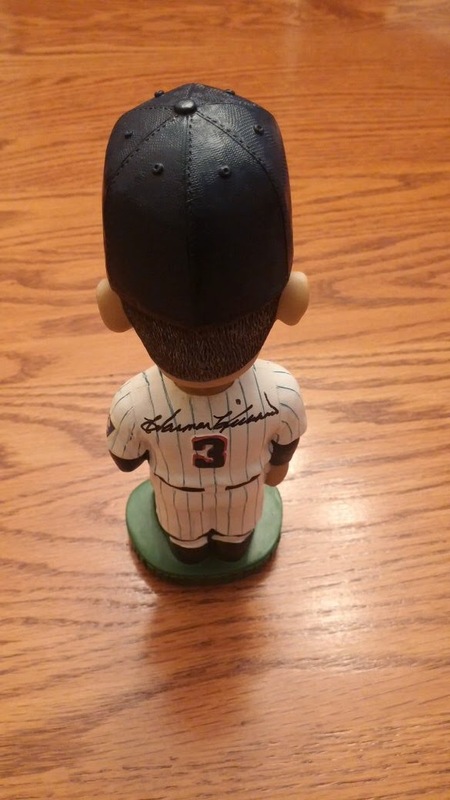 At the Valley West card show today I picked up a Harmon Killebrew signed bobblehead, with JSA authentication. It's the Stadium Give Away (SGA) version of the 40th anniversary of the 1965 World Series team. I have the Hurricane Katrina set version signed already, but this was offered at an attractive price so I bought it. 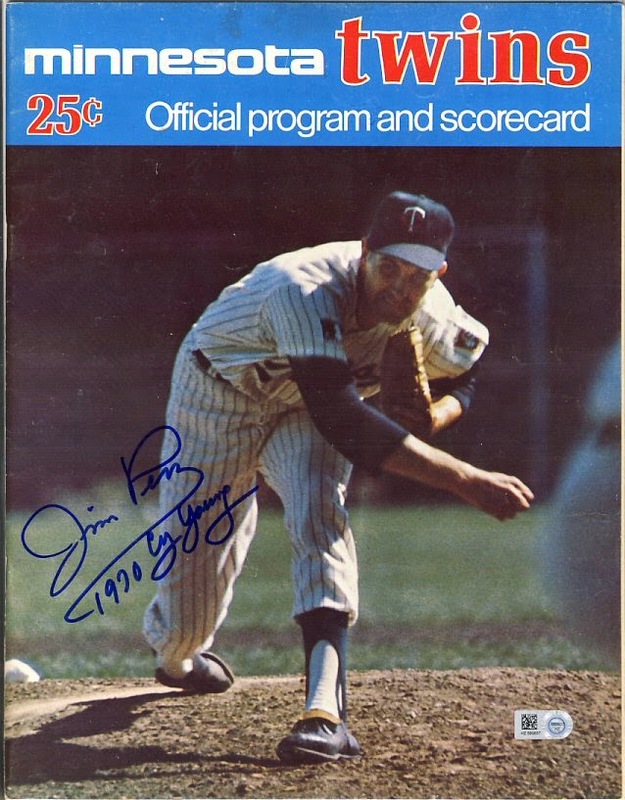 I also bought the Jim Perry version, unsigned, for my son to get autographed at the All Star FanFest tomorrow. 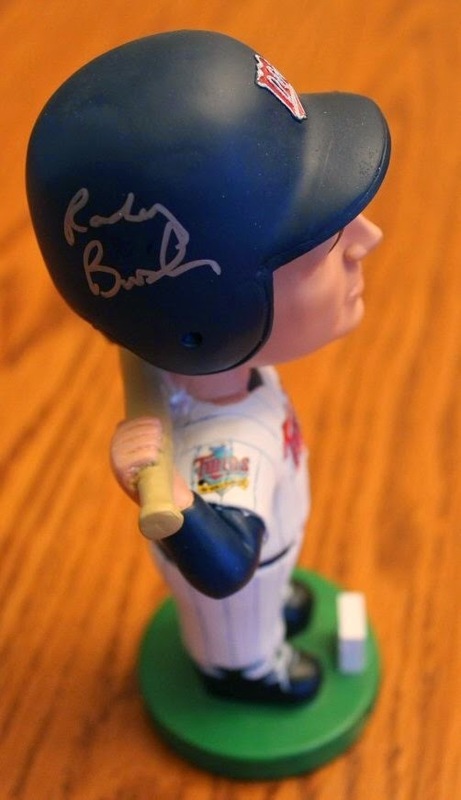 I'm hoping to get Randy Bush to sign both his Twins World Series bobbleheads. Anything else will be a bonus. 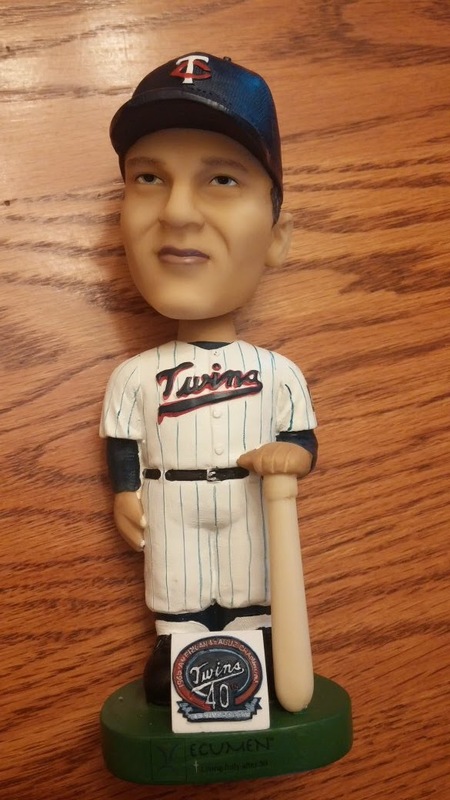 I walked by a coworker's desk yesterday and noticed a Tom Brunansky bobblehead that was recently given away at Target Field. I knew he was a Minnesota Wild fan, but I didn't think he was really a baseball fan. So, I asked him if he wanted to sell it and he did. The quality of the paint is pretty poor. I wonder if it's mine, or if they're all this bad. Tomorrow I'm going to the Valley West card show to pick up a few bobbleheads. One signed, and one unsigned. 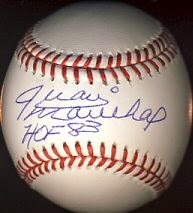 My older son and I are going to the All Star FanFest on Sunday, so I'll look for more items to get signed. I'm mostly interested in getting bobbleheads signed by Randy Bush and Doug Mientkiewicz, but we're also going to see Al Newman, Gaylord Perry, Juan Marichal, Gene Larkin, Fergie Jenkins, Orlando Cepeda and Jim Perry. Not a bad line up! 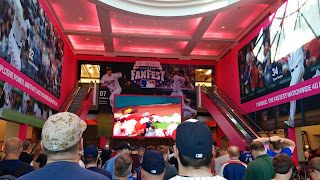 Today I stopped by FanHQ at Ridgedale Mall to pick up the Justin Morneau bobbleheads I dropped off earlier for their private signing with him in Milwaukee. They did a great job and they both look really nice. 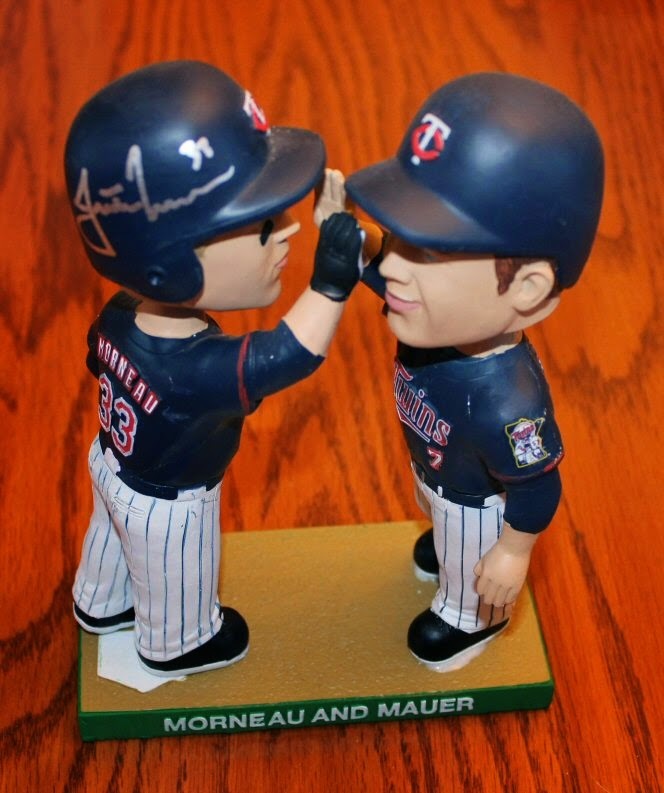 Now I need to get Mauer to sign his. I'm making pretty good progress on my bobblehead collection and am hoping to add a couple more at the All Star FanFest next weekend. 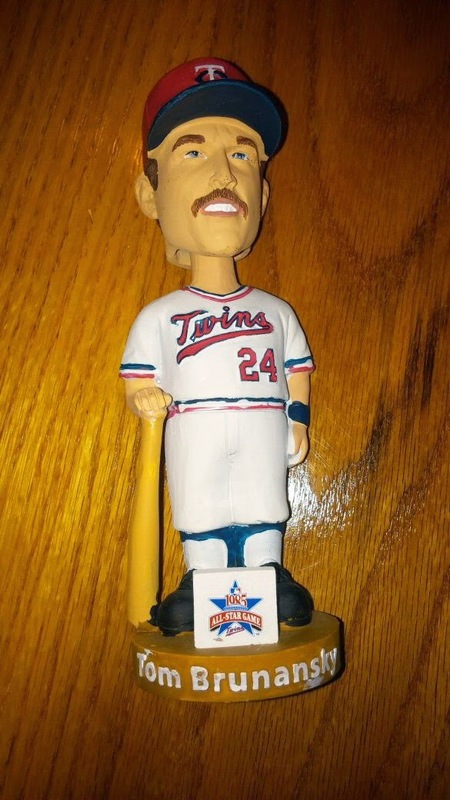 I'm going Sunday so I'm hoping to get Randy Bush on his 1987 bobblehead as well as Doug Mientkiewicz on his SGA bobblehead.